The world went global before parliamentarians went global. Parliamentarians globally are tied to local problems and next election. Yet, they are faced each day with more and more issues that cut across constituencies, countries and regions. These problems are global in nature, with no local or immediate solutions. They need a uniﬁed cross-country and global response. This thoughtwas sparked by Kailash Satyarthi, Nobel Peace Laureate 2014 and Chairperson, Global March Against Child Labour and Senator Cristovam Buarque Ph.D and Brazilian Senator, to bring togethermembers of parliament from different continents on the issue of children rights. While the idea of bringing together parliamentarians across countries and regions is not new, the notion of “Parliamentarians Without Borders for Children's Rights” has still not caught on, especially on issues of human rights, particularly slavery and child labour. 'Parliamentarians Without Borders' will give parliamentarians the opportunity to address the issue of children rights with their direct counterparts in different parts of the world. Freedom is the soil for democracy. But children who are trafﬁcked, enslaved and exploited as child labourers are denied freedom. They are denied the right to a free childhood. 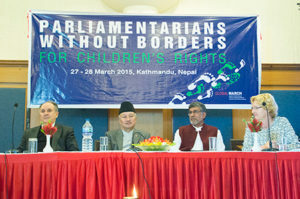 ‘Parliamentarians Without Borders’ is an active group of members of parliament from different countries, spanning across continents working together to create awareness about children rights and ways to implement those rights into local and international law, fulﬁlling the parliamentarians' primary obligation as legislators. The parliamentarians will work within the framework of the UN Convention on the Rights of the Child. ‘Parliamentarians Without Borders’ is organizing their ﬁrst meeting on 27 and 28th March 2015 in Kathmandu Nepal. Parliamentarians from around the world today concluded the deliberations for the first ever ‘Parliamentarians Without Borders for Children’s Rights’ (PWBFCR) meet. This is a joint initiative by Nobel Peace Laureate, Kailash Satyarthi and former Chairperson, Global March Against Child Labour and Brazilian Senator Cristovam Buarque Phd. The parliamentarians united to create a strong group of legislators who would engage with their constituents on children rights and work together with multiple stakeholders to eliminate pressing concerns such as child labour and child slavery nationally and globally. 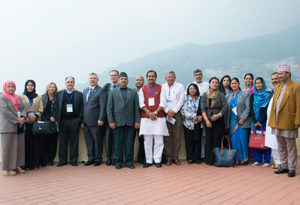 The forum witnessed the participation of over fifteen parliamentarians from nine countries who discussed a range of issues concerning the elimination of child labour, child slavery and trafficking; the need for equitable, inclusive and quality education for every child and the promotion of laws that protect children from “all forms of violence”. Focussing on the role of Parliamentarians in furthering children's rights within the purview of the SDGs, Ms. Amina J. Mohammed, Special Adviser to UNSG for Post-2015 Development Planning, said, “Members of Parliament are key players in the implementation of the Sustainable Development Goals.” She further elaborated on the need to domesticate the SDGs in their countries once finalised and to lay down their vision for the same. First meeting of PWBFCR ended with a pledge to specifically focus on protecting and promoting children's rights at regional, national and international levels by working closely with government and coordinating agencies. In an initiative led by Nobel peace laureate Kailash Satyarthi, 22 parliamentarians from Afghanistan, Bangladesh, Brazil, India, Nepal, the Netherlands, Pakistan, Paraguay and Turkey pledged to protect and promote the rights of children. 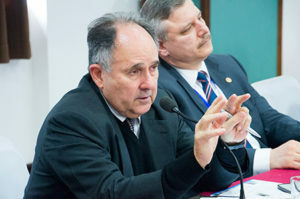 Speaking in his role as North American board member of the Global March Against Child Labor, Tim Ryan from Solidarity Center pointed out the intrinsic connections between child labor, equitable economic development and promoting healthy democratic societies that work for all citizens. 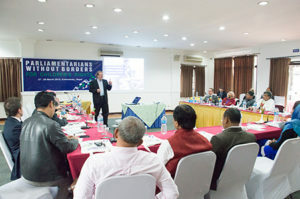 Following the success of the first ever meet of Parliamentarians Without Borders for Children's Rights (PWB) that was held last year in Kathmandu, the second meeting of the PWB, was held in The Hague, The Netherlands on 8th & 9th July 2016. The meet was hosted by Mr. Roelof Van Laar, Member of Parliament, The Netherlands. With participation from more than 15 Members of Parliament from different parts of the world, this one of a kind meeting brought innovative ideas, strategies and commitments from the Parliamentarians for addressing some of the most pressing concerns of children.In the 1.5 day event, the Parliamentarians brainstormed and discussed ways to not only eliminate child labour, trafficking and slavery as legislators, but also identified and agreed on key actions to be taken by Parliamentarians for strengthening education, and devising child responsive budgeting. At the end of the meet a Declaration was agreed and signed by all the participants describing the key actions that will be taken by the parliamentarians in next one year. 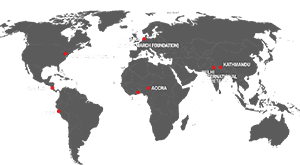 The third meet of the Parliamentarians Without Borders for Children's Rights is proposed to be held in Accra, Ghana in 2017. 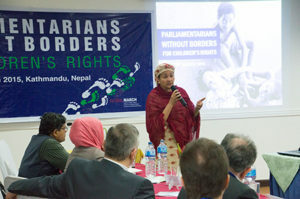 The first Asia Meet of Parliamentarians Without Borders for Children's Rights was held in Dhaka, Bangladesh from 3 & 4 April 2017, with participation from about 13 Members of Parliament from 5 Asian countries such as Afghanistan, Bangladesh, India, Nepal and Sri Lanka. As South Asia is the second largest region of trafficking, it has become increasingly imperative for the region, to take the issue of trafficking and child labour seriously and find sustainable solutions to combat the same. 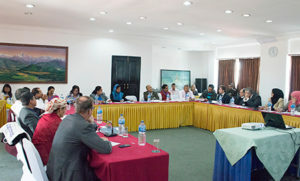 Thus the first Asia Meeting of PWB was organised to bring these issues into context and to encourage Members of Parliaments to prioritise the issue of children and take action to not only restore rights of children within their countries and constituencies but also to influence policies at the regional level such as that of SAARC or ASEAN. The meeting began with knowing the Parliamentarians present and the situation of child labour, slavery and trafficking in their respective countries. At the meeting, the main themes which were focussed upon were “Legislators' Role in Combatting Trafficking Related Exploitation of Children, Especially of Girls and Women”, “Legislators' Role in Improving and Strengthening Access to Quality Education for All: Building the Future of Nation and Asia,” and the “Legislators' Role in Supporting Elimination of Child Labour in Business Supply Chains, Integrating Children's Rights with Business Principles.” From the discussions under these themes, it became clearer that Parliamentarians must think and act beyond borders, as the problems of children have no boundaries. The Parliamentarians collectively stated that a dedicated day in the Parliament must discuss only the issue of children's rights and that quality, inclusive and equitable education must be delivered no matter what. The co-founder of this initiative, Mr. Kailash Satyarthi encouraged the Parliamentarians by saying that now is the time for them to show their bold leadership. There are very few champions for the cause of children in the Parliament, and taking action for children can make them different from others. He furthered motivated by reminding them of the power of democracy that this region is endowed with and that we must use this opportunity to speak up for the most marginalised people and children of the region, and also against the fundamentalist propaganda that is increasingly clouding the atmosphere of the nations. He asked the Parliamentarians to build youth leadership and direct their energies constructively for the betterment of children. The meeting thus ended with a proposal of making the initiative of Parliamentarians Without Borders for Children's Rights a self-funded and self-regulated body. 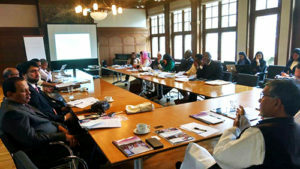 The meeting also concluded with the idea that each PWB member must focus on the Parliamentary Forums in their own countries and take support from their Parliaments through dedicated sessions on children's rights, interventions on daily basis, involving local communities and stakeholders and looking out for ways of financing the group activities. Writing a joint letter to the SAARC Secretariat to pass a resolution on children was also proposed along with deciding a plan of action for the Asian Parliamentarians to move forward. The meeting ended with signing of a declaration that was endorsed by all members present.